If you wish to browse the Index for the Kenmare Estate Rural Tenancies 1874-1881/2 please do so by means of the Index link to the right. If you wish to browse either of the Rent Ledgers Volume 1 or Volume 2 please do so by means of the two links also to the right. Unfortunately the Rent Ledger referred to in the Index as Volume 3 is not among the records currently held by the Library. Step 1. Please search for the tenant’s Surname in the alphabetical Index. 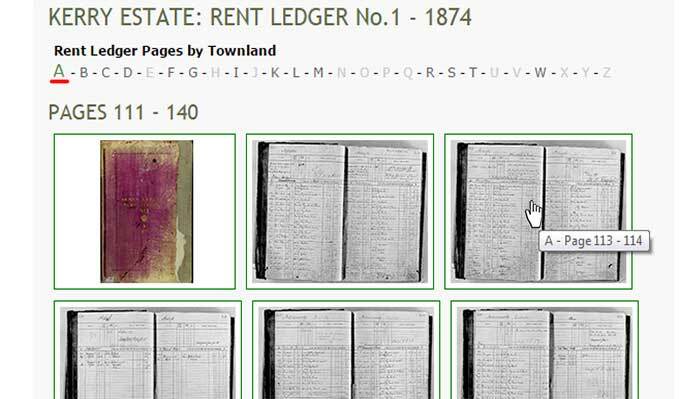 When located, please take note of the Townland name, the number of the Rent Ledger and the relevant Page Number. Step 2. Then use the information provided in the Index to access the relevant Rent Ledger (either Volume 1 or Volume 2). Please search under the first letter of the Townland name to access the relevant pages. However the Index will still indicate for this missing volume the townland that was associated with a particular tenant.